Anytime we can listen to true self and give it the care it requires, we do so not only for ourselves but for the many others whose lives we touch. This desire to hold space well for other people is vast and diverse. I have heard from the most fascinating range of people about how this post is being circulated and used. It’s showing up in home schooling forums, palliative and hospice care circles, art communities, spiritual retreat centres, universities, alcoholics anonymous groups, psychotherapists’ offices, etc. The most interesting place I heard about it being shared was within the US Marines. It is also touching the lives of people supporting their parents, children, spouses and friends through difficult times. The lesson in this is that no matter who or where you are, you can do the beautiful and important work of holding space for other people. There are so many of us who are making this a priority in our lives that I feel hopeful that this world is finally swinging like a pendulum away from a place of isolation and individualism to a place of deeper connection and love. Isn’t that a beautiful idea? Recently, I participated in an online course on “Leading from the Future as it Emerges: From Ego-system to Eco-system” and the underlying premise of the course was that we need to find a way to make deeper connections with ourselves, others, and the earth so that we bring about a paradigm shift and stop this crash course we’re on. There were more than 25,000 from around the world participating in the course. That’s a LOT of people who share a common passion for changing the ways in which we interact and make decisions. I walked away feeling increasingly hopeful that I am part of a swelling tide of change. The response to my blog post has further reinforced that hopeful feeling. We are doing the best we can to live in love and community. We are not perfect, and sometimes we still make selfish decisions, but we are doing our best. Thank you for being part of the change. The other thing that struck me as I read through all of the comments, emails, etc., is that, while all of you are all responding from a place of generosity and openheartedness, wanting to learn more about holding space for others, you also need to be given permission and encouragement to hold space for yourselves. This is really important. If we don’t care for ourselves well in this work, we’ll suffer burnout, and risk becoming cynical and/or ineffective. PLEASE take the time to hold space for yourself so that you can hold space for others. It is not selfish to focus on yourself. In fact, it’s an act of generosity and commitment to make sure that you are at your best when you support others. They will get much more effective, meaningful, and openhearted support from you if you are healthy and strong. In the Art of Hosting work that I do and teach, we talk about “hosting ourselves first”. What does it mean to “host myself first”? It means, simply, that anything I am prepared to encounter once I walk into a room, I need to be prepared to encounter and host in myself first. In order to prepare myself for conflict, frustration, ego, fear, anger, weariness, envy, injustice, etc., I need to sit with myself, look into my own heart, bear witness to what I see there, and address it in whatever way I need to before I can do it for others. I can’t hide any of that stuff in the shadows, because what is hidden there tends to come out in ways I don’t want it to when I am under stress. AND just as I am prepared to offer compassion, understanding, forgiveness, and resolution to anything that shows up in the room, I need to offer it to myself first. Only when I am present for myself and compassionate with myself will I be prepared to host with strength and courage. In other words, all of those points that I made about how to hold space for others can and should be applied to yourself first. Give yourself permission to trust your own intuition. Give yourself only as much information as you can handle. Don’t let anyone take your power away. Keep your ego out of it. Make yourself feel safe enough to fail. Give guidance and help to yourself with humility and thoughtfulness. Create your own container for complex emotions, fears, trauma, etc. And allow yourself to make decisions that are different from what other people would make. This isn’t necessarily easy, when you’re doing the often stressful and time-consuming work of holding space for others, but it is imperative. Here are some other tips on how to hold space for yourself. Learn when to walk away. You can’t serve other people well when your energy is depleted. Even if you can only leave the hospital room of your loved one for short periods of time, or you’re a single mom who doesn’t have much of a support system for caring from your kids, it is imperative that you find times when you can walk away from the place where you are needed most to take deep breaths, walk in nature, go for a swim, or simply sit and stare at the sunset. Replenish yourself so that you can return without bitterness. Whenever you can, take a longer break (a week at a retreat does wonders). Let the tears flow. When the only thing you can do is cry, that’s often the best thing you can do. Let the tears wash away the accumulated ick in your soul. A social worker once told me that “tears are the window-washer of the soul” and she was right. They help to clear your vision so that you can see better and move forward more successfully. When my husband was in the psych ward a few years ago, and I still had to maintain some semblance of normalcy for my children, I spent many, many hours weeping as I drove from the hospital to the soccer field and back again. Releasing those tears when I was alone or with close friends allowed me to be strong for the people who needed me most. Let others hold space for you. You can’t do this work alone and you’re not meant to. We are all meant to be communal people, showing up for each other in reciprocal ways. As I mentioned in my original post about holding space, we were able to hold space for my mom in her dying because others (like Anne, the palliative care nurse) were holding space for us. Many others were stopping to visit, bringing food, etc. We would have been much less able to walk that path with Mom if we hadn’t known there was a strong container in which we were being held. Practice mindfulness. Mindfulness is simply “paying attention to your attention”. In mindfulness meditation, you are taught that, instead of trying to stop the thoughts, you should simply notice them and let them pass. You don’t need to sit on a meditation cushion to practice mindfulness – simply pay attention to what emotions and thoughts are showing up, and when they come, wish them well and send them on their way. Are you angry? Notice the anger, name it anger, ask yourself whether there is any value in holding onto this anger, and then let it pass. Frustrated? Notice, name, inquire, and then let it pass. Find sources of inspiration. There are many, many writers, artists, musicians, etc. whose wisdom can help you hold space for yourself. When I was nearing a nervous breakdown earlier this week because of the intensity of my post going viral, I went to a Martyn Joseph concert (my favourite musician), and when he started to sing “I need you brave, I want you brave, I need you strong to sing along, You are so beautiful, and I’m not wrong”, I was sure he was singing directly to me. (Watch it on Youtube.) That evening of music shifted the way I felt about what was going on and I was able to walk back into my work with courage and strength. Later in the week, when my site crashed and I was having trouble bringing it back to life, I went to sit in the poetry section of my favourite bookstore and read Billy Collins. Let other people live their own stories. You are not in charge of the world. You are only in charge of yourself and your own behaviours, thoughts, emotions, etc. Often when you are a caregiver, you’ll find yourself the target of other people’s frustration, anger, fear, etc. REMEMBER – that’s THEIR story, not yours. Just because they yell at you doesn’t mean you’re doing it wrong. Take a deep breath, say to yourself “I am not responsible for their emotion, I am only responsible for how I respond”, and then let it go. When you’re feeling wounded by what they’re projecting on you, return to the points above and walk away, practice mindfulness, and let others hold space for you. Find a creative outlet for processing what you’re experiencing. Write in a journal, paint, dance, bake, play the guitar – do whatever replenishes your soul. Few things are as healing as time spent in creative practice. One of my favourite things to do is something I call Mandala Journailing, where I bring both my words and my wordlessness to the circle. You can learn to do it yourself in Mandala Discovery: 30 days of self-discovery through mandala journaling (which starts April 1st). I hope that you will find the time this week to hold space for yourself. Your work is important, and the world needs more generous and open hearts who are healthy and strong enough to serve well. Interested in more articles like this? Add your name to my email list and you’ll receive a free ebook, A Path to Connection. I send out weekly newsletters and updates on my work. I have one that I had commented about in your other article and that is about acknowledging and honoring yourself. I will go into this further. 8. Honor and acknowledge yourself as a divine and worthy human being. Far too often do we get into this rut of not feeling worthy of being loved or loving others. There is a need and a desire for people to “improve” upon themselves and whereas this can be a positive thing for people it can also be one that can be debilitating because your “inner critic” will come out telling you that you can do better,or you did okay right now but you could do much better,or you arent pretty enough to wear that dress or you arent good enough to work at that job etc etc. The idea is to say to yourself “I am worthy and I am enough” self empowerment doesnt have to mean self aggrandizing or having the ego take over. it is just a gentle reminder that you are okay as you are and that you are worthy and that you are enough. because you are,you are worthy,you are enough and you are beautiful”. Thank you for this article,what a great way to empower yourself mindfully and with heart. This add is powerful for me today Jason – thank you. I love your articles about holding space for ones self and others. If you need to hold space for yourself, please come and visit and use my off-the-grid cabin in the High Sierra. I finally clicked on your article about holding space, and it led me here. I am a facilitator and writer, and learned about holding space when I was in training. I have never heard or read it so beautifully described, with such gentleness and love. Thank you for reconnecting me to something that matters to me. You added another piece to my emerging picture today. Thank you for describing so beautifully what has been opening up for me recently, I feel what you write and it’s really nice to have read it explained in structured words. Though that is not necessary, it ’s more comprehendable and it feels even more real to me now. Wishing you a beautiful journey with holding space for yourself and others in every place it takes you! In supervising for clinical Social Workers and counseling caregivers, my mantra to is, “We can’t give out of an empty cup.” Then, we explore what filling their/my cup would look like. Thank you for your service through these articles. Your article has a force so subtle. The message is timeless. Life, creation cycles. Ebb and flow. Your message rings true. Thanks for the reminder. I am a childcare worker and find the the demands take away the essence of what, where, how and when I provide for the places and spaces I hold for others. This was passed on to me from a wonderful and kind friend …. this past weekend, March 20th through March 22nd, I felt squeezed, smothered, and broken. Yesterday, I connected with my friend, and she sent your link, explaining that what I was experiencing was absolutely OK …. I’m better today, but I’m saving this as a gentle reminder for my own Journey …. Thank you for putting into words so well something that some of us do without ‘consciously’ realising it… and then following up with holding space for self ~ so evidently important! Heartfelt thanks. ahhh…! a very articulate expression, Heather, condensing many things I have learned in 12- Step recovery groups, non-violent communication studies, The Empowerment Dynamic and HeartMath: to trust one’s intuition, placing one’s own peace of mind as a top priority, to trust others’ decisions, to allow vulnerability (Brené Brown), and to ride loose in the saddle of life. You articles are definite “keepers” to be shared. Thank you for posting this. Thank you for writing this. I love the tips and ideas on how to hold space for yourself. Thank you for sharing how you are doing that as you move through this exciting time of growth and change. I am a hospice nurse and I find it easy to “hold space” for others, yet I have no idea know how to “hold space” for myself. I think the biggest obstacle for some of us can be giving ourselves permission to treat ourselves FIRST the way we plan to treat others. Thank you for the recommendations. Thank you. You have graciously guided us, through example and story and gentle guidance to understand and appreciate. You filled my spirit and gave me hope, even when I didn’t need it. Your explanation is beautiful and I appreciate it. I will continue to refer to this and share it for a long time. Thank you for sharing your work. I often forget to hold space for myself and appreciate the guide you offer. Very wise! Thankyou – came right time and right space for me personally..now refreshing my own support safety net…it is sound..just a bit of mindful mending required! Special of you to share – very meaningful to oh so many of us! 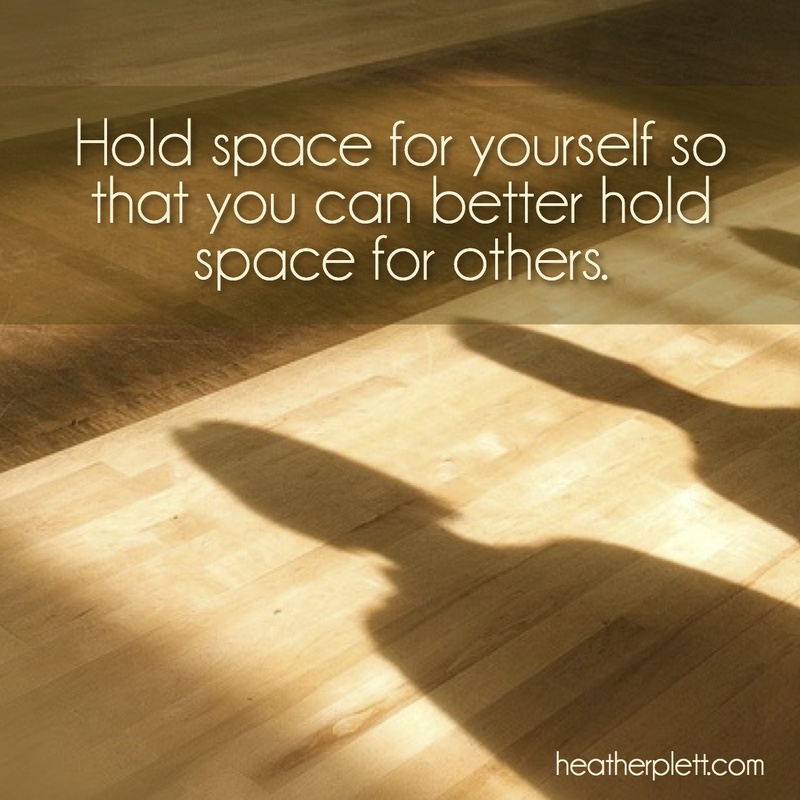 Love reading both articles of holding space for others and yourself. Great reminders and insight. Thank you! I have been blessed to have always known the importance to hold a space for myself and agree with all you have said one thing I would add to number 1 “Learn when to walk away” is “Learn WHO To Walk Away From” or better yet “Protect Your Space – By Who You Let In”. In my case, mindful meditation and journaling has been a huge part in helping me identify people in my life that don’t belong in it. Not to say these people won’t be invited back in my life; however, each season in ones life needs to be treated wisely… Walking away from those bad influences or negative people allows me a greater space to grow. Walking away also gives me clarity, yet when they are still in my circle it is much harder because their energy tends to drain me and even blind me, all in all I end up giving them more of my power than I would like to admit. I now Gracefully take my power back by kindly removing those negative people from my life. Thus, I protect my space. Thank you for your wonderful writings. AND for the reminder to hold my space, because so often I don’t until I almost melt away in holding space for others. I will definitely work on it. the world need more people like you..
we need the tools and guidance to deal with emotional, physical, and mental situations. This is one of the best pieces I’ve seen for a deep healing process that we are all capable of regardless of our beliefs, spiritual, political or other. I’ve said for many a year that music saved my life – it’s been an anchor when all else seemed lost. This is what being a seasoned nurse is, one who has assimilated beyond the physical, beyond the art, this is the nurse who “gets” her/his patient, and allows their patient not only to be “gotten” but also to reveal themselves on an intimate plane such that the patient also gets the nurse. Ahhhhhhh, peace. I need to learn to hold space for myself and would like secular based information about this or names of secularists or secular groups doing this, please. Thank you Heather. Interestingly I’d come across your other holding space article and randomly scheduled it to post on my Facebook page yesterday, without knowing how much I’d need it at the time. Last week my husband was in a bad motorcycling accident out of state and as a mom of five I’m gradually learning how to hold space for all that I’m responsible for… It’s the most beautiful experience really, and yet I really get what you’re sharing here because as a helper it’s easy to rush in to hold space for others when in actuality I cannot hold space unless I’m willing to do it for myself, lovingly. Thank you for these pointers and reminders, they’re needed. And thank you for holding space and humanity. It’s needed too. Much love and appreciation for you and the important work you’re doing. WOW… This is exactly what I need at this time. Blessings to You & Your Family. Wonderful exactly what I needed to read right now.thank you for writing these pieces. Thank you!!! As a social worker I find that I do not “hold space” for myself. Thank you for making me pause and reflect. My best friend’s husband died last year. She lives over 500 kms from me and it was a couple of months before I was able to go and stay with her for about a week. Previously I was there for her on the end of the phone and provided a container for her during what was a very difficult time. This year in February, she discovered that she had breast cancer. I am a very busy teacher and it was a hugely busy time for me. I live on my own and do not have family or other support in a practical sense and was quite depleted. I also have an animal family to care for. I simply did not have the wherewithal to go to stay with her. The only thing I could do was text her every week to let her know I was thinking about her and to send a present of some healing crystals and a card. I struggled a great deal with this decision and the conclusion I came to is that I had to honour my own life first. This is her journey to make and she is surrounded by people who know a lot more about cancer than I do. She also has family support and is in a very different and more secure financial and material position than I am. I could not stretch more or offer more. I am also not sure if she would understand the place from which I am coming. I felt very guilty and yet knew that if my life fell apart that would only add to the stress I already felt. The lesson in all of this for me is that I have to honour my own life first and give to myself. If I can stretch more and it will not damage my own life, then I may be able to offer more. It does not mean that I do not care about my friend, but that my life matters too and attempting to care and give when already depleted does not help anyone. This is my friend’s journey, not mine. I have held the space for her over several years and even more last year when her husband died. Perhaps it is wise to realise that we are not god-like and need to recognise our own humanness and limitations and then our caring and giving comes out of a more truthful space. Loved ur article. Holding space for others has changed my outlook. If you are a single parent struggling with support bringing up a child/children alone, you won’t be going on a weeks retreat for a good 16-18 years! A friend came across your work and sent it to me because I wrote a book and have a website called The Holding Space Practice. https://holdingspacepractice.com/ and she thought I’d be interested in seeing someone else’s take on the topic. It is interesting to me that ideas emerge simultaneously but independently in the world. Three years ago when your wrote this I was writing similar truths from my point of view and experience. May the ripple continue and spread! Thank you to all who are practicing these principles and making the world a better place!!! Join my mailing list and receive a free e-book, news of upcoming programs, and a new article every 2 weeks.